Top banker Arundhati Bhattacharya , 59, rarely stumbles over words. That too to clinch a sale. In September 1996, when she moved to the US on a transfer posting, juggling audit functions and settling the family, she had experienced a rare buyer's dilemma. The SBI honcho had to step into a New York street to buy a perambulator for her daughter. But when none of the Big Apple's shopkeepers heard of the word, a determined Bhattacharya gestured a push cart, pulled out a picture of her daughter and waved it in front of a puzzled salesperson who mumbled: "Oh! you mean a stroller?" The deal was struck in a matter of minutes. "Every posting has challenges in terms of language, culture, food habits and the way of working," grins Bhattacharya, who worked in almost all the regions of the country. In her over four years stint in the US, she got used to right hand driving, turn a water tap to the left and, yes, the proficient ways of the global financial centre in the world's largest economy. "The way they worked is very professional in terms of detailed policies, procedures and meticulous documentations of everything," says Bhattacharya from her 18th floor corner room at SBI's headquarters in Mumbai's Nariman Point. It is not at all easy to hop from one city to another and from one function to another especially for a career woman with a very young child. But she braved all the challenges that came her way in a near four-decade-long career. Her extremely methodical way of working, people skills and a highly competitive spirit have stood her in good stead. Many say reaching the top slot in a male-dominated PSU banking set up and that, too, in the country's largest bank with over Rs 20 lakh crore assets size, is no mean achievement. In the last two years, she managed to put a check on SBI's non-performing assets, focuss on profitable growth and also introduced new initiatives in the digital banking space. "She is laying a good foundation for the bank, especially in the mobile-driven new banking landscape," says Vimal Bhandari, an old IL&FS hand, and a former country head of AEGON India. The numbers speak for themselves. SBI's net profit jumped 20 per cent to Rs 13,102 crore, deposits were up by 13 per cent at Rs 15.76 lakh crore, retail advances climbed 15 per cent at Rs 2.72 lakh crore and NPAs are down from 4.95 per cent to 4.25 per cent in March 2015. Bhattacharya has managed to deliver an encouraging performance despite the challenging economic environment. The stamp of approval comes from none other than Deepak Parekh, Chairman, HDFC. "You will steer the bank to greater heights," said Parekh in a recent book release function. "She is able to keep every constituent of the bank in good humor. Be it customers, employees, government (as owner) or the RBI," says a former SBI chairman. Today, Bhattacharya is fixated on the six strategic goals she set for the bank two years ago. "We have changed the way we do project screening and also monitoring," she says. The focused approach on NPAs has not only resulted in curbing bad assets growth, but has also helped in reducing gross NPAs by 70 basis points to 4.25 per cent in March this year. Bhattacharya also did not hesitate to let go of a few defaulters, such as Hotel Leela and Bharati Shipyard, by selling them to asset reconstruction companies. In fact, the message has been clear to promoters: either come to the table and negotiate or deal with recovery companies. She has also introduced dynamic evaluation of larger projects to monitor any signs of stress or risks in advance. Bhattacharya is laying the foundation for transforming the 208-year old public sector bank to make it appealing for the younger generation. The bank's origins date back to 1806 when Bank of Calcutta was set up. In 1921, Bank of Calcutta along with two other banks were merged to form Imperial bank of India, which then became State Bank of India in 1955 when the Reserve Bank of India (RBI) took majority ownership in the bank. 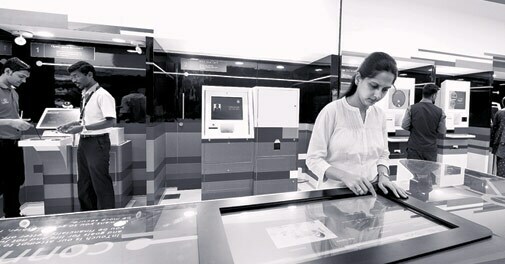 Within months of taking charge, Bhattacharya cut the ribbon for half a dozen fully digital branches where a kiosk machine scans a customer's fingerprint, saves digital signature, takes a picture and scans required documents. There is absolutely minimum human intervention. She is now scaling up such cost-effective branches to 250 in the current year that would include a mix of new and existing branches. The task is cut out for the bank, which has 16,000-plus branches across the country. A fortnight ago, she also launched a mobile wallet to compete with the new generation private banks and also the PayTMs of the world in the retail payments space. Her work, however, does not end with launching a mobile application. She has been constantly on the lookout for innovations in the mobile banking space to keep abreast of the changing digital world and the opportunities it throws up. Two months ago, Bhattacharya landed in Bangalore along with her top management team to meet some technology geeks. As many as eight entrepreneurs made their presentations. "The purpose was to see what they have for us in the digital space," says Bhattacharya. She is now working with a couple of those entrepreneurs. Bhattacharya's stint as the chief general manager (new businesses) of the public sector bank six years ago comes in handy. She had successfully laid the foundation of three new businesses - general insurance, infrastructure fund and custodial - right from the conception stage. In a stint lasting one year and eight months, she sewed up three joint ventures - Insurance Australia Group for general insurance, Macquarie for infrastructure fund and Societe Generale for custodial business. "That was a period of intense negotiations, dealing with international law firms and also managing different time zones of joint venture partners," recalls Bhattacharya. She also made the best use of her SBI capital markets stint from November 2012. One, it gave her an exposure to look at a project not just as a debt lender, but in its entirety from equity, hybrid instruments to debt. Two, she started pitching for qualified institutional placements (QIPs) and also got equity raising mandates for companies including NTPC, SAIL and CARE Ratings. Bhattacharya recalls her first few pitches to corporates drew a blank as SBI's capital market subsidiary was not as big a name in the market as the PSU bank. She told her team members that probably she's jinxed. "I had told them that they should go and do it on their own and I shouldn't be there," says Bhattacharya in a lighter vein. That sense of humour has earned Bhattacharya the accolade of being a people's person. She has undertaken a large career development scheme linked to the performance of the bank's employees. The targets are more scientifically assigned based on the potential of the place. "We have also created groups or cohorts so that employees can see how they are performing within the cohorts," says Bhattacharya. The idea is to have a comparison. For example, comparing an employee in Bangalore to an employee in Noida or Gurgaon, but not with an employee stationed in Bhagalpur. As the bank is transforming by using digital channels, she says, new addition to the existing over 200,000 workforce will undergo change as digital channels require a different set of skills. Bhattacharya often counsels people who are reluctant to take up transfers. Having worked in Kolkata, Lucknow, Bangalore and New York, she says a transfer actually enables employees to face some synthetic challenges. "A transfer also keeps your boredom away as it helps to keep you engaged," Bhattacharya smiles. The SBI chief's journey to the top is undoubtedly paved with personal sacrifices. So where does she draw her inspiration and strengths from? Bhatta-charya, fiercely independent in all her dealings, reveals that her mother and maternal aunt wielded a great influence on her. Both were self-made women in their own rights. During her growing up years at the Bhilai steel plant in Chhattisgarh, Bhattacharya found everyday-life to be extremely difficult for the family. Even for essential items one had to make a trip to nearby Raipur, which was about 30 kilometers away. She grew up seeing her mother making the most of her life - studying and practising homeopathy - without wasting time on cribbing. Her aunt earned two Masters degress before competing her BEd to make the best use of her time. When her aunt, who volunteered to take care of her daughter in the US had to leave because of visa issues, Bhattacharya had no option but to send her daughter back to Kolkata, where her mother and aunt took care of her. "I have had these two strong women in my life and they did influence me a lot," says Bhattacharya. Even today, despite her chock-a-block schedule, Bhattacharya, a student of English literature who dreamt of becoming a writer, manages to take time out to read. She recently finished reading a book: 'Lady, you are not a man! ', where the author, Apurva Purohit, talks about women's quest for a work-life balance. The next book engaging her attention is The Great Golden Sacrifice of Mahabharata by Maggi Lidchi. She doles out traces of that wisdom in conferences, seminars or while writing to shareholders and employees. Recently, she picked up Hollywood hunk Sylvester Stallone's dialogue in Rocky. "Life is not about how hard of a hit you can give. It's about how many you can take and still keep moving forward." Read it as a message to the competitors from the rock-steady lady who still has one year at the helm of affairs at SBI.